That went on for three more long minutes and several more PowerPoint slides. This company pitch was administered to me by a technology sales rep preceding the demo he took me through. And ironically, despite how long he spent discussing his company and its background, I don’t even remember the company’s name. In fact, I bet some of you struggled to even get through reading those first quoted paragraphs. Be honest, did you skip part of it? So the question is: do we spend time at all discussing our company? What’s too long, what’s too short, and what’s just right? winning the deal down the road in the sales cycle. 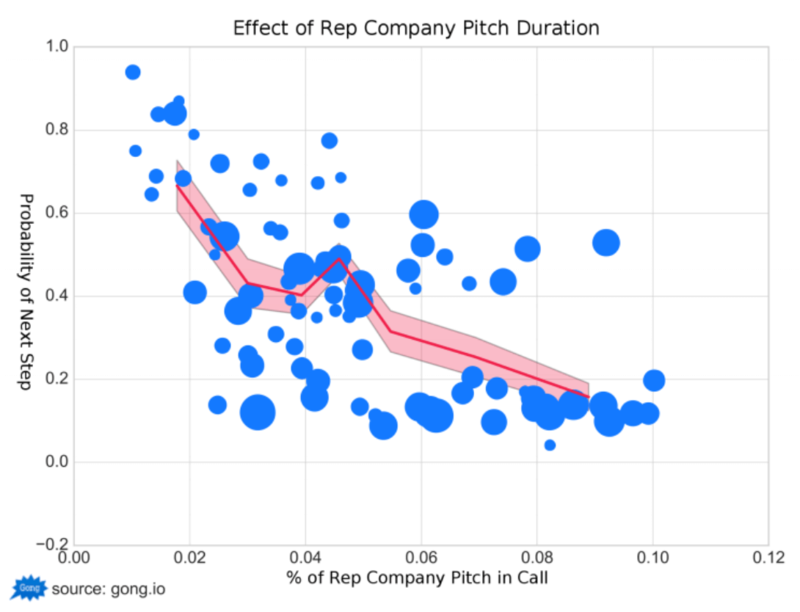 The extreme drop-off in win-rates and call effectiveness happen when sales professionals discuss their company for more than 2 minutes in a call. It’s almost as if the 2-minute mark is a cliff. Any more than 2 minutes, and the probability of closing the deal rapidly declines. If you’re inclined to spend a full 10% of the call’s duration discussing your company in general terms in one way or another (pitching your company, explaining its history, or any other general company-centric discussion), your odds of closing the deal are a mere 25% of what a top sales professional’s average win-rate is. For example, if the top sales rep on your team has a 24% win-rate and you continually discuss your company for 10% of the duration of your calls, your win-rate is predicted to be a mere 6%. Potential customers care little for your company. They care about their problems, unexploited opportunities, and solutions you can provide. The best use of discussing your company is when you’re dealing with a conservative buyer who is concerned about the long-term viability of the vendors he or she chooses due to making a high-stakes, big-ticket purchase. In situations such as that, your tactic should be to discuss your company in a way that positions it as a stable, safe choice to purchase enterprise-level products from.